Apple rolled out an update to Mac OS X Mountain Lion Wednesday that brings with it system-wide Facebook integration. 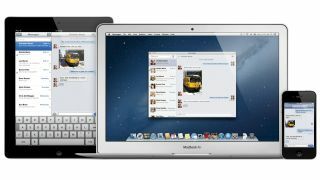 On a day when most of the attention will be dedicated to the release of iOS 6 for mobile devices, Mac OS X 10.8.2 brings single sign-on access to the world's most popular social network. Users will be able to sign into Facebook, as they have with Twitter, and share links and photos, download friend details to the Contacts app, and also see notifications in the new Notifications Center. The Facebook integration also stretches to Game Center, which now includes Facebook Likes on each game's page and shared high scores through Facebook, email, and Twitter. Beyond the baked-in Facebook support, Apple lists a host of other intriguing new features within the Software Updates section of Mac OS X and on its online support pages. "Adds Power Nap support for MacBook Air (Late 2010); iMessages sent to your phone number now appear in Messages on your Mac; You can now add passes to Passbook (on your iPhone or iPod touch) from Safari and Mail on your Mac; FaceTime can now receive calls sent to your phone number; New shared Reminders lists." The opportunity to answer FaceTime calls on your Mac is a decent addition, while adding to your iPhone or iPod touch's Passbook app directly from the Mac will also prove useful. Mac OS X 10.8 also features a host of minor upgrades and bug fixes. To see them in full, head over to the Apple support pages. Happy downloading.